A few days back the team from Black Dog contacted me asking me if I was willing to review their scotch. Let me be frank here, I thought somebody was trying to play a prank. I played along and lo, a month later, I was contacted asking me to collect my bottle! I was elated. The bottle, as far as I had heard and known, was utterly expensive. And the one I got was truly expensive. Just like a kid who gets a new toy is excited, so was I! I had never tasted scotch till date in my life, except may be one of the brands that Dad had got as a gift when I was a kid, probably when I was 13 or 14 years old! It had tasted different, it had smelt different, nothing like I had ever had all my life. I used to steal a few sips from it when my parents would be away and then pop a cardamom hoping to mask the smell. I never knew that such small sips would not leave any kind of smell, unless of course I had at least a few pegs! Once I got the bottle in my hand, it definitely was a different feeling but an additional feeling and sense of responsibility was overwhelming me. The bottle was safely hidden away in the car and retrieved only after I got home! The very first response that I got from my bro +Prateek Thakker was that of disbelief! Mom would never allow liquor at home. This was precisely the reason why I had not disclosed about it to any one at home, not even my wife! 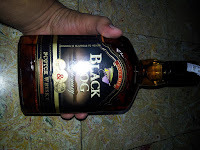 I picked up a bottle of Kingfisher Soda and bro picked up a bottle of Thums Up for himself. 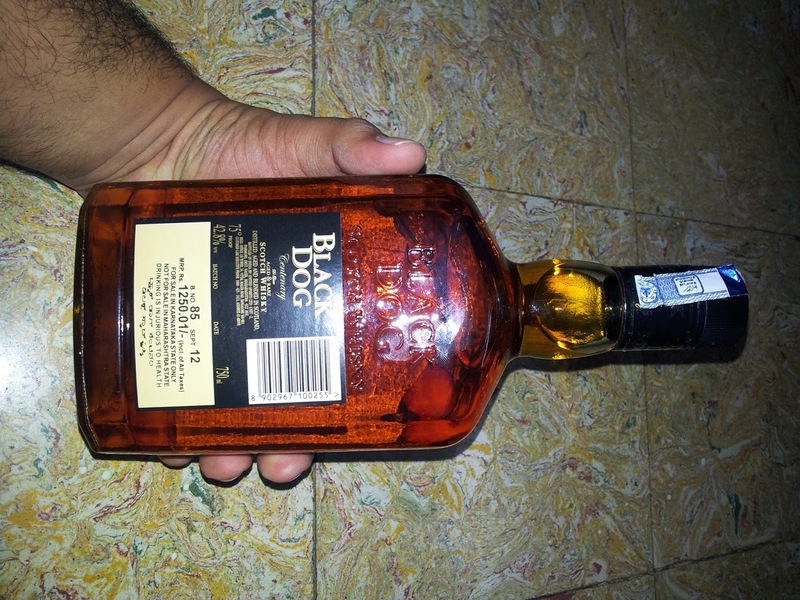 He said he would not be able to drink the scotch without Thums Up. After everyone had slept, or rather forced into the room by us, we pulled the bottle out of the box and the first impression about the bottle was that it looked very ordinary! Not something that I had expected out of UB for an iconic brand like Black Dog. We were so very expecting an out of world bottle given the empty bottles that my Dad had collected aeons ago! Expectations now at a low, we opened the bottle. However, this time, our expectations were indeed exceeded. The confidence had been restored! The smell was heavenly. Intoxicating in fact! However, the clumsy us had neither picked up ice nor had we picked up anything to eat! We placed the bottle back and arranged for something to eat and ice was pulled out of the fridge! The scotch was poured, the ice was dropped, the stage was set! Glasses clinked and the liquid shined. As usual with anything that I eat or drink, I took a small sniff first and then a big whiff. It smelled woody and full bodied. 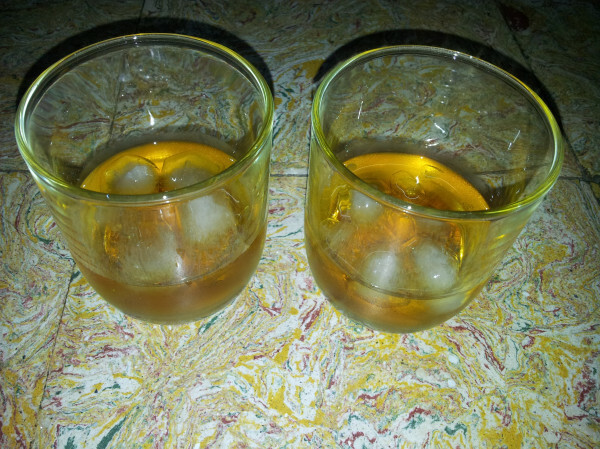 We decided to taste it as it is, on the rocks. After all what better way to judge something than in its true form! The liquid trickled down, smooth and evenly leaving a uniform taste around the mouth. It definitely tasted different. Different from the Beer and Vodka that I generally have. The taste was as woody as it smelt. A close description would be the same taste as that of the varnished wooden scales that we used in school! 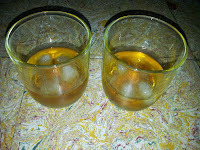 But this was no varnish, it was scotch and we liked the taste. 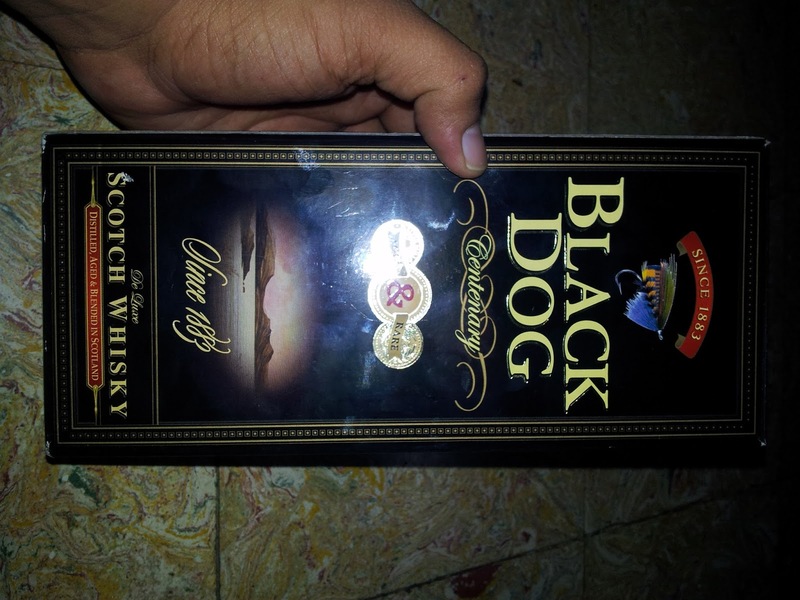 Next in our agenda was to try out the scotch with the soda and Thums Up. 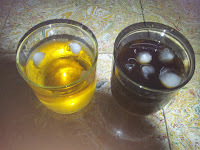 We poured each other another glass and topped it up with soda and Thums Up. This time the drink tasted fairly different. Its tastes definitely had muted themselves. The effect had been drowned. The glass with Thums Up tasted even terrible! It tasted both sweet and bitter alike! Not my cup of tea this was! It was drowned quickly and a third glass was poured, this time we took no chance and had it on rocks once again! More details about Black Dog Evenings here. All in all we may have had quite a few pegs and had a thorough time enjoying the drink! A different experience altogether! Coming to recommendations, give it a shot at least once in your life! By not trying we definitely miss out a lot of excellent and lovely things! I am reminded of an iconic dialogue that Amrish Puri had in the movie Shehanshah!